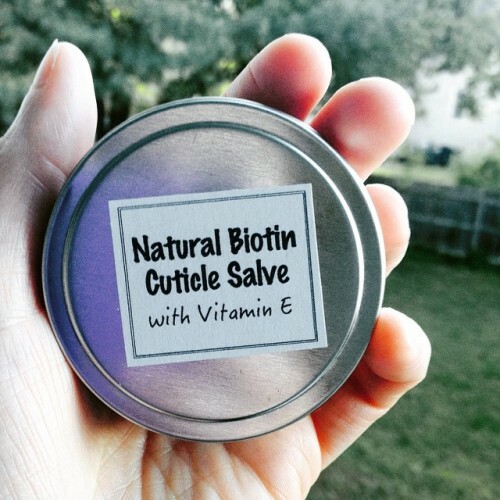 This homemade Biotin cuticle salve recipe contains Biotin , also known as vitamin B7 or vitamin H, and is believed to help with healthy skin, hair and nails. 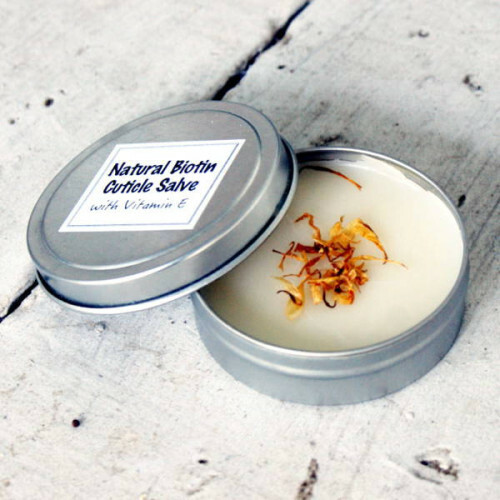 In addition this cuticle salve recipe also contains non-GMO vitamin E oil and argan oil. Vitamin E oil is well known for its antioxidant properties. Antioxidants have been shown to help to prevent and repair skin damage caused by free radicals as well as encourage cell growth. Argan oil absorbs quickly and is often used in skin, nail, and hair treatments to deliver deep hydration, strengthen brittle hair and nails, and to help to prevent and reduce stretch marks. Make and use this homemade Biotin cuticle salve recipe not just on damaged cuticles but on dry or cracked hands and feet as well. It’s up to you! I used powdered Biotin from capsules for my Biotin cuticle salve recipe, however, you can also use liquid biotin if you like. Keep in mind, however, that liquid biotin will contain other ingredients in addition to the Biotin. And what you don’t use after you’ve made this Biotin cuticle salve recipe can be taken internally as a daily supplement! Using a digital scale weigh out the beeswax and coconut oil and place in a double boiler. Heat until the ingredients have melted fully. Then weigh out the argan oil and stir into the coconut oil and beeswax. Empty three capsules of Biotin into the salve mixture. Next, using a graduated transfer pipette, measure out the vitamin E oil and stir into the cuticle salve ingredients. Mix the ingredients until well blended, then pour into a 1 oz. tin and allow to harden fully. You can speed up this process by placing the salve in the fridge. For an even more healing cuticle salve recipe, infuse the argan oil with calendula flowers first! To make your infusion, fill a mason jar with more argan oil than called for in the recipe then add calendula flowers to the oil until it reaches the same level of the oil. Store in a cool, dark location for 3-6 weeks, then strain through cheesecloth. If you’re in a hurry, combine the ingredients in a double boiler or in a mason jar inside of a pot filled about 2/3 of the way full with water. Heat on warm to low for 3-4 hours, then remove from heat and allow to cool. Strain the oil through cheesecloth back into your mason jar. Psst. If you liked this homemade Biotin cuticle salve recipe, you may also want to check out my Natural Herbal Healing Balm Recipe. To use, simply apply to cuticles, hands or feet as desired and massage into skin. The Biotin powder will exfoliate away rough areas while the oils work to help promote healing and repair skin. For even more of my skin care recipes be sure to follow me on Pinterest for collections of my favorite bath and beauty recipes from around the web. Plus, keep track of all my new beauty and skin care recipes by following Soap Deli News blog via Blog Lovin’ and Tumblr. You can also find me on Facebook, Twitter, G+ and Instagram.